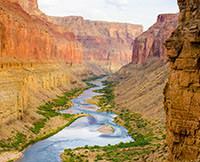 Every detail of the transportation to the Colorado River in the Grand Canyon was flawless. The Western River Expedition guides were incredible. This Grand Canyon rafting trip was the trip of a lifetime.